Remember when Robert Valley's gorgeous shorts for DC Nation blew our minds with their great new take on Wonder Woman? 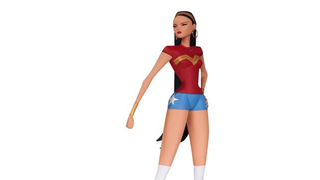 Well, rejoice - Valley's Wonder Woman is finally getting some merchandising love. An Animated Wonder Woman Like You&apos;ve Never Seen Her Before! It's something DC have been doing for a long time, but I really appreciate their recent focus on capturing a specific creator's style in a figure or statue. It's nice that we can get huge swathes of merchandise that are all visually unified, but it's even better when you get something that stands out and looks unique like this does. Now I just want even more of those animated shorts.